I have revised very little of my critique of The Turn of the Screw since I wrote it 40 years ago at the age of 30. I have intermittently gone back a time or two to fix grammatical and syntax errors, as well as changing some of the time references, i.e. “almost 100 years ago” to “over 100 years ago”, which makes more sense now in 2016 than it could have in 1976. But I have made no major changes as I didn’t want to lose or distort the energy or conviction with which I wrote at that earlier time. And it still states basically what I want to express. However, I have broken up my 1976 critique into Prologue, Body, and Conclusion for readability. I broke it up in case the reader becomes bored with, or upset by the levels, depth and quantity of conundra presented by James in the body of this story and finds himself approaching an uncomfortable level of ‘aperspectival madness’ from my exposition of it. This reader may wish to proceed to the Conclusion and try to resolve his discomfort, or boredom there. And recently I have added a Foreword, an Introduction, and an Afterword in which I can ramble on in my older age about things that seem important and/or more explanatory to me now. 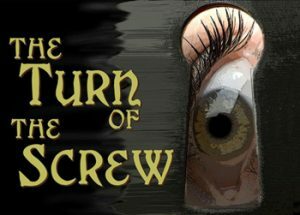 I have also taken the liberty, hoping Adrian Dover, the author of The Ladder website doesn’t mind, of linking to this site as it contains the full text of The Turn of the Screw, and the pages have the very helpful function of being able to link to particular paragraphs of meaningful parts of the story. I have linked to certain paragraphs of the story in case the reader of my critique would like to refresh his memory of a certain section. This site is an altogether worthwhile one for any James aficionado and has much material here not covered in my critique, though much, if not most of it will be linked to. The links will all open in a new tab. Is it true that God’s a word? Does sentence have such power? Do paragraphs define the herd? Do stories check this hour? By print or lore non-prisoned? Is right so right, and wrong so wrong? Are bad and good the short and long? Is that all yours? This, mine? And never guess the truth. Is but a sparrow’s tooth.